Daily lifting from nature with Green Lift Complex. The lavera Firming Day Cream stimulates the skin's own collagen system with the specially developed lavera Green Lift Complex. The skin is padded, wrinkles are alleviated. The silky formula absorbs quickly and provides with 3-fold effective hyaluron and valuable karanja oil for moisture and comprehensive care. Application: Apply every morning to cleansed skin of face, neck and décolleté and gently massage with gentle circular movements. 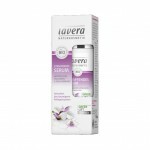 For optimal care results in the evening use the Lavera Firming Night Cream.